Maga Engineering emerged the category winner under Best Managed Project in Construction/Infrastructure Development Sector for the construction of 47-storey Clearpoint Residencies at the recently-concluded National Project Management Excellence Awards 2018. 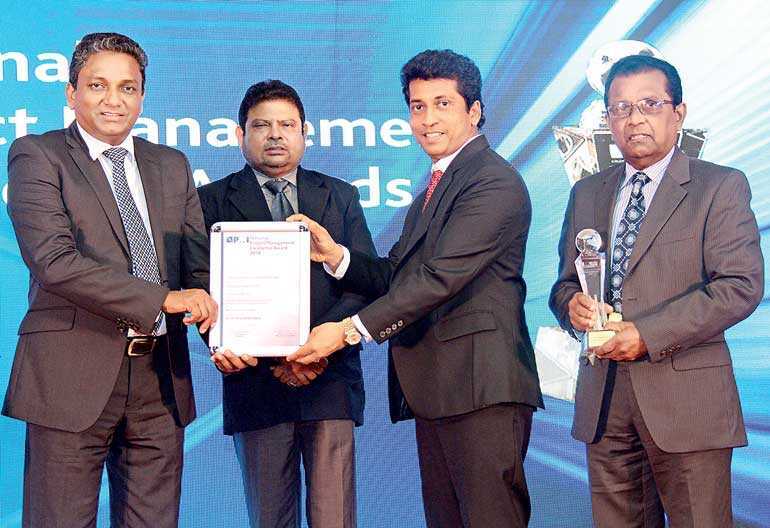 This prestigious award ceremony, organised by the Project Management Institute Sri Lanka Chapter was held for the second time in Sri Lanka to recognise complex projects that best deliver superior performance of project management practices, superior organisational results and positive impacts on the society. At the same time, the award scheme recognises project outcome, technologies, innovative functions and Sri Lankan content in the project prioritising the value delivered by the project to its clients. Known as the ‘tallest vertical garden in the world’, Clearpoint Residences is a joint venture between Milroy Perera Associates and Maga Engineering. A brainchild of renowned architect Milroy Perera, the residential apartment tower is a holistic green building which accommodates 171 apartments across 47 floors. One of its many highlights are the planted terraces encircling the building. The plants are maintained through a specially designed automated drip irrigation system that uses recycled water. Furthermore, several self-sustainable features such as solar panels, rain water harvesting, water recycling and solid waste management have been incorporated. The planted terraces offer the building a unique character while providing many benefits: Formation of a green cover provides a natural cooling system for the entire building, resulting not only in a fresher, more relaxing atmosphere, but also less energy consumption on air-conditioning. This blanket of trees endows the building with an innate soundproofing system. It also provides shade and buffer radiant heat. Clearpoint is also the first high-rise building in Sri Lanka to contain fully-fledged rainwater harvesting, automated drip irrigation, grey water recycling and solid waste disposal systems, as well as solar panels that can power all its common areas. This award also endorses Maga’s investments in leading the cause of promoting green buildings in Sri Lanka as the leader in the construction sector of the country. The company remains focused on service and product excellence and is committed to its vision of creating lasting socio-economic value for all stakeholders. Being a multidisciplinary construction company, Maga continues to offer a diversified range of construction services across industrial, government, real estate and commercial sectors in Sri Lanka.